It seems the “children of the 80s” have spoken! Is it proper to call this an upset? I certainly didn’t see it coming. I’m most surprised, however, that the 1950s didn’t get a single vote! No love for the decade that spawned The Seventh Seal, Touch of Evil or Vertigo? Anyway, I can’t complain too much about the winner — now excuse me while I watch Ferris Bueller’s Day Off to celebrate. This Week’s Poll: Alright, folks, it’s starting to get warm outside, and the summer blockbusters are already rolling in. My question for you this week is: what upcoming summer blockbusters are you most looking forward to? This is a pick two, so make sure you take advantage of this. What’s caught your eye this year? Haha, sounds like a good time, man. I haven’t seen any of the Fast & Furious movies since the first one, but I have to admit I’m curious about Fast Five. Hopefully Fast & Furious 6 surprises like that one. I didn’t get a chance to vote, but I agree with the results of the poll! Good deal, Taylor! Thanks for the comment! Yeah, good point. I suppose I shouldn’t have been too surprised. I’m surprised the 50s received no votes as well. It produced many fine films. I voted for Pacific Rim and The World’s End. Both I really want to see. Yeah, The World’s End looks like it should be a lot of fun. Edgar Wright has yet to disappoint. Wow, I am not really looking forward to any of those movies. I think Elysium and The World’s End have potential, but yeah, I’m with you on the rest. Thankfully there are some better indie titles on the horizon (i.e. Before Midnight). I think the problem with the fifties is aside from the really good movies that have made a high impact on films in general, you also have movies that people aren’t going to really remember, know about, or care about. Like the films that studios would make theaters run in order to play the much anticipated feature films. An example would be Killer Shrews (dogs done up to be giant killer mice), Plan 9 From Outer Space, etc. Basically the birth of the b-movie. I also think Hollywood would rather remake half of these films rather than try to bring them back so people can get a grasp of where films have come from. I think you also have to convince the general public that watching the films from this decade would be just as entertaining as what is currently being released. My favorites from the fifties arel: Seven Samurai, The Hidden Fortress, H-Man, Forbidden Planet, Cyrano de Bergerac Treasure Island, The Day the Earth Stood Still, The Hitchcock films, etc. Yeah, it’s always hard to get the general public interested in classic films, especially if they are in black and white. That’s a shame because there are so many fantastic movies from back then, and watching them even helps enrich the experience of new films. I always get a kick out of when a modern film has an homage to a classic — hell, it’s even more fun to watch The Simpsons now since I “get” most of its pop culture references. That’s a great list of films you mentioned. Glad you included The Day the Earth Stood Still — that’s an amazing film. Shame the remake was so awful. I love that film, along with some other Sci-Fi classics. I don’t know what it is but I love a good portion of those black and white sci-fi shows as well (Outer Limits, One Step Beyond, Twilight Zone, etc.) that my dad exposed me to. Which are your most anticipated summer blockbusters, Eric? I’m going with Gatsby and The World’s End. I feel the same way about the 80s. 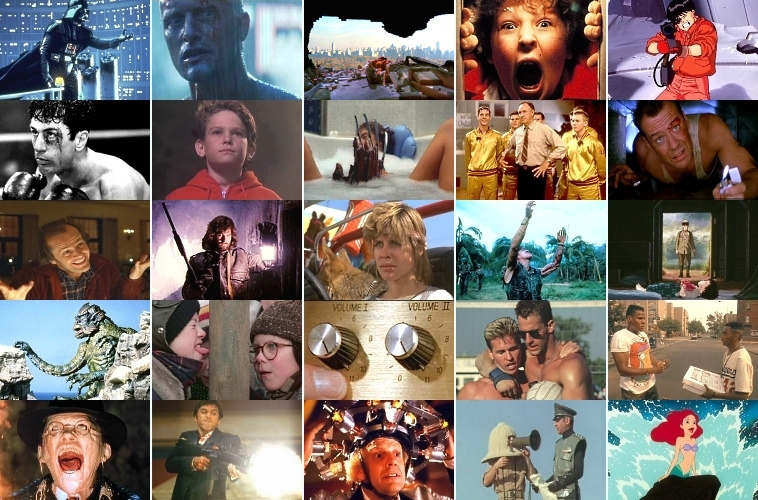 My initial thoughts were that it was the decade of cheese and bad taste, but there were *a lot* of great films released back then, including some of my favorites. I’m not really feeling the blockbuster season this year, but I’m with you on The World’s End. That one should be a lot of fun. Elysium is probably my second pick, simply because I loved District 9. Nothing for the 50s?!? NOOOOOOOOOO! Maybe I should have made this a “pick two.” Certainly the 50s would have gotten some votes then. Hah, yeah I am a little curious about Man of Steel, too. Hopefully since Nolan and Goyer are attached to the film, they will be able to keep Snyder in check. I would have voted for the 50s! Damn it, that decade was amazing. Rear Window, Night of the Hunter, Les Diaboliques, the movies you mentioned, Witness for the Prosecution, 12 Angry Men… So good. Yeah, I was really surprised it didn’t get a single vote. So many classics from that decade. Yeah, the 50s definitely deserved more love but like I said last time this is the toughest poll ever because its such a crapshoot, and then I have to decide, do I vote for the decade with the greatest amount of ‘great’ movies, or the decade that has the movies which resonated with me the most? Which admittedly is normally the decade of movies you grew up watching… Now for this question, Gatsby, and its not even close. I’m trying to stay away from reviews of it until I see it. I’ve been jazzed to see it ever since I saw it announced. Yeah, great point. It’s always hard to choose between “best” and “favorite” unless they happen to coincide. I’m not sure what to expect with the Great Gatsby. That could be really good, or it could be an awful trainwreck. Hell of a cast, though.